This can be served warm or cold. It was originally part of a recipe-testing project that required me to use Trader Joe’s products, so you’ll notice that in the dressing I recommend using one of their items, but it can easily be substituted as I note. 3 tablespoons Trader Joe’s Honey Apple Butter OR 3 tablespoons any of the following: apricot preserves, apple butter of your choice, or 3 tablespoons honey. 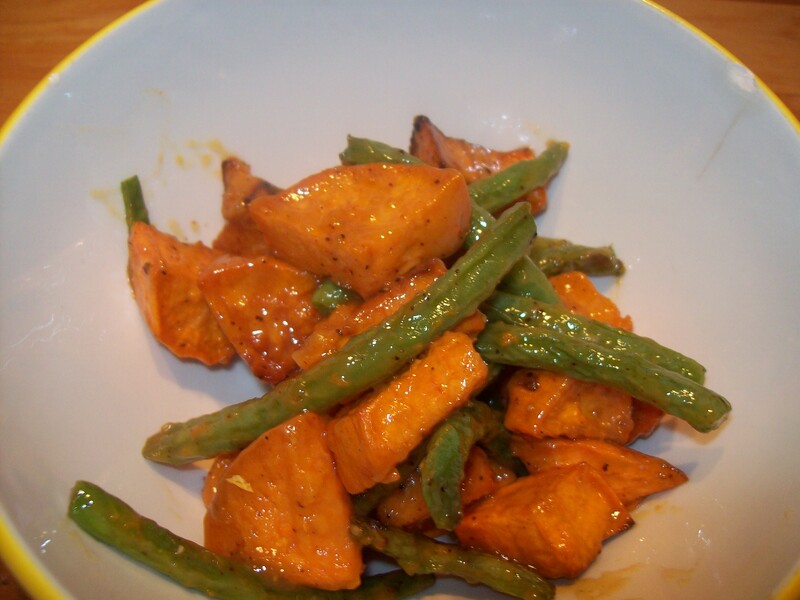 On a large sheet pan, toss sweet potatoes with 2 tablespoons olive oil, 1 tsp. salt, and ½ tsp. black pepper until evenly coated. Roast at 400 degrees for 20 minutes. Remove sweet potatoes from the oven. Add green beans to the pan and stir. Return the pan to the oven and continue to roast for an additional 10 minutes, until sweet potatoes are tender. In a small bowl, whisk together Honey Apple Butter, Dijon mustard, olive oil, ½ tsp. salt, ¼ tsp. chili powder, and ¼ tsp. black pepper. Transfer vegetables to a large bowl. Pour dressing over vegetables and toss until evenly coated.